This NALC Veteran patch is available for purchase from the NALC Supply Department. Click here for details. 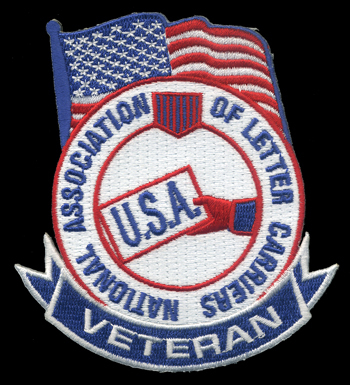 Veterans of the U.S. Armed Forces comprise almost a quarter of the membership of the National Association of Letter Carriers—active NALC members as well as retired members. These veterans traded their military uniforms for letter carrier uniforms, and they continue to serve their communities and this great nation. Oftentimes, gratitude is expressed in words such as “thank you,” but it’s rarely followed up with any tangible expressions. The creation of the NALC Veterans Group is intended to be something tangible and useful. The NALC Veterans Group is designed to provide NALC members who are military veterans access to the information and tools specific to veterans’ rights and benefits within the U.S Postal Service. It seeks to provide all NALC members who are also military veterans—active full-time and part-time letter carriers, as well as retired letter carriers—resources, rights information and a sense of camaraderie. The postmaster of a post office in Bristol, CT, permitted the members of NALC’s Veterans Group—and of Hartford Branch 86—to wear their Veterans Group T-shirts as part of their letter carrier uniform on Nov. 10, the day before Veterans Day. The Veterans Group will provide the ability to connect with fellow NALC veterans and stay informed on issues of importance to letter carrier veterans. Members receive a pin as a symbol of gratitude for your military service and membership in the NALC. If you are interested in joining the group, complete the sign-up card included in the October 2015 issue of The Postal Record and return it to: NALC Veterans Group, National Association of Letter Carriers, 100 Indiana Ave., NW, Washington, DC 20001-2144. You may also click here to download a version of the card that allows you to type in your information and then print and mail, or (if you have trouble with the previous card) click here to download a version of the card you can print, fill out by hand and mail. A note about web links on this page: Some links may take you to pages not owned or managed by the National Association of Letter Carriers. NALC does not necessarily endorse any products or services that may be advertised or available on such websites, nor does NALC control the opinions or information presented there. In leaving NALC’s website, you will be subject to the privacy, accessibility, copywriting and other policies and rules that apply to those websites. Since its launch in August 2017, more than 20,000 Veterans have used VA Video Connect to receive care and currently more than 4,000 VA providers across the country are set up to use the system. More can be found here. Considering submitting a claim for an increase in your disability compensation? VA’s new Decision Ready Claims (DRC) program delivers decisions within 30 days. More can be found here. The U.S. Department of Veterans Affairs (VA) will begin accepting applications on April 2 from Veterans interested in competing in the 2018 National Veterans Golden Age Games in Albuquerque, New Mexico, Aug. 3-8. More can be found here. The Veterans Crisis Line connects Veterans in crisis and their families and friends with qualified, caring Department of Veterans Affairs responders through a confidential toll-free hotline, online chat, or text. More can be found here. With a focus on improving access to mental health care for Veterans living in rural areas, the U.S. Department of Veterans Affairs (VA) announced it has launched a pilot telehealth program that will give rural Veterans with post-traumatic stress disorder (PTSD) remote access to psychotherapy and related services. More can be found here. New Jersey has released a guide for veterans to find out if they qualify for special tax programs designed to honor our veterans. The guide can be found here. The Defense Department has announced that veterans will soon be able to shop online at military exchanges. The policy change will extend limited online military exchange shopping privileges to all honorably discharged veterans of the military, DoD officials said in a news release. Most veterans can benefit financially from provisions in the federal retirement laws that permit inclusion of military service time in total years of federal civilian service, and thus significantly increase retirement income. There are two federal retirement systems that cover career postal employees. The Civil Service Retirement System (CSRS) covers most employees first hired in a career position prior to Jan. 1, 1984. The Federal Employees’ Retirement System (FERS) covers most employees first hired on or after Jan. 1, 1984. Both retirement systems use “years of service” to determine in large part when you become eligible to retire, and how much you get when you retire. The time you served in the U. S. Armed Forces can be added to your “years-of-service” for the purpose of determining when you become eligible to retire, and how much you receive once you do retire. Most veterans (but not all) must make a payment in order to obtain retirement credit for military service. This is called “making deposit for” or “buying back” your military time. The amount you pay, the amount of increased retirement benefits, and the rules regarding “making deposit for” military time are very different, depending on which retirement system you are in—FERS or CSRS. Generally, FERS employees pay 3 percent of their basic military pay and receive an increase in annuity of 1 percent of their high-3 average annual salary for each year of military time. Generally, CSRS employees pay 7 percent of their basic military pay and receive an increase in annuity of 2 percent of their high-3 average annual salary for each year of military time. Additional information is available at the NALC Retirement web page. If you have questions, comments or issues, call the NALC retirement department – toll free 800 424-5186 (MWF 10 AM to noon and 2 PM to 4 PM Eastern time). Military veterans are, and have been, important and valued members of the letter carrier craft. Many veterans come to carry mail with service-connected disabilities and have long, injury-free careers. For others, previous service-connected disabilities can be aggravated by the wear and tear of carrying the mail. Veterans should understand their rights under federal law to compensation for on-the-job injuries. Military veteran letter carriers are eligible for protection under both the Department of Veteran’s Affairs (DVA) and the Federal Employee Compensation Act (FECA) administered by the Office of Workers’ Compensation Program (OWCP). Letter carriers with DVA disability ratings are eligible for coverage under FECA if their job duties aggravate their pre-existing service-related disability. While such injuries are protected under FECA, veterans need to be mindful of both the benefits and the limitations the dual coverages of DVA disability and FECA impose. Under FECA, an injured letter carrier whose claim is accepted is entitled to medical benefits and wage-loss compensation. For letter carriers with DVA disability ratings, applying for some FECA benefits may require an election between the DVA benefits and FECA benefits. If the injury as a letter carrier is for the same body part as a service-related disability, an accepted claim under FECA can provide benefits for injury above and beyond the original DVA disability rating. An injury unrelated to a DVA disability rating is eligible for full coverage under FECA. FECA regulations address the apportionment of injury and require claims examiners to communicate with the DVA prior to the award of wage-loss compensation to prevent the dual payment of benefits. This is not always done properly, resulting in overpayments of FECA benefits. Injured letter carriers with DVA disability ratings need to be alert to the danger of an overpayment. OWCP asks injured workers if they have ever applied for disability benefits from the DVA on forms CA-7 and EN 1032. Even if OWCP is duly notified of the DVA benefits, they may not adjust compensation, resulting in an overpayment. This can result in substantial charges for overpayment by OWCP, causing financial hardship on injured workers. Injured letter carriers can avoid these charges by not claiming wage-loss compensation from OWCP until their proper level of compensation has been accurately determined. This may take longer than expected, as OWCP will need to determine the proper increase in disability for the service-related disability. At the same time, DVA disability ratings may be increased due to the on-the-job injury. Such increases will effect the eligibility of wage-loss compensation under FECA. Even if you have a DVA disability rating for an injury, there are good reasons to file a claim under FECA. As most veterans with service-connected disabilities continue to get their health care from the VA, they may want to continue to use their DVA physician. Injured workers with DVA disability ratings are not prohibited from seeing a non-DVA physician for their on-the-job injury. Under FECA, a compensably injured letter carrier has the option of choosing his or her attending physician and can be referred to specialists for his or her particular injury. DVA physicians are sometimes reluctant to process the necessary medical narratives for veterans claiming on-the-job injuries. One of the benefits for having an accepted claim is the Postal Service’s obligation to make every effort to find work for compensably injured workers. It’s important for an injured letter carrier to inform his or her DVA physician that, by having an accepted OWCP claim, the Postal Service has an obligation to find work for him or her within his or her limitations. Physicians want their patients to heal and return to work when possible. Informing your physician of Postal Service obligations may help you secure the medical narrative you need. While the regulations for coverage under both FECA and DVA disability have complex rules, any letter carrier with a service-connected disability who suffers an injury in the course of performing his or her duties should apply for protection under FECA. If you have any questions about such claims, call your national business agent’s office for help. Can a disabled veteran be disciplined for absences while receiving medical treatment? A disabled veteran who is directed to report for observation or treatment by a duly authorized medical authority must be granted leave and the absence cannot be used against the employee for disciplinary purposes. This right to be absent from work to receive medical treatment without threat of discipline has its root in an Executive Order. By law, veterans who are disabled or who served on active duty in the armed forces during certain specified time periods or in military campaigns are entitled to preference over non-veterans, both in hiring from competitive lists of eligibles and in retention during reductions in force. The goal of the veteran’s preference is not to the place a veteran in every vacant federal job. However, preference does provide a uniform method by which special consideration is given to qualified veterans seeking federal employment. Preference applies in hiring from civil service examinations, for most federal-service jobs, and when agencies make temporary appointments or use direct-hire and delegated examining authorities from the Office of Personnel Management. Military retirees at the rank of major, lieutenant commander or higher are not eligible for preference unless they are disabled veterans. When applying for federal jobs, eligible veterans should claim preference on their applications or resumes. Applicants claiming 10-point preference must complete form SF-15, Application for 10-Point Veteran Preference. In a campaign or expedition for which a campaign medal has been authorized. Any Armed Forces Expeditionary medal or campaign badge, including El Salvador, Lebanon, Grenada, Panama, Southwest Asia, Somalia and Haiti, qualifies for preference. A campaign medal-holder or Gulf War veteran who originally enlisted after September 7, 1980 (or began active duty on or after October 14, 1982, and has not previously completed 24 months of continuous active duty), must have served continuously for 24 months or the full period called or ordered to active duty. The 24-month service requirement does not apply to 10-point preference eligibles separated for disability incurred or aggravated in the line of duty, or to veterans separated for hardship or other reasons under 10 U.S.C. 1171 or 1173. A veteran who served any time and who (1) has a present service-connected disability or (2) is receiving compensation, disability retirement benefits, or pension from the military or the Department of Veterans Affairs. Individuals who received a Purple Heart qualify as disabled veterans. A mother of a veteran who died in service or who is permanently and totally disabled. If you meet the criteria for preference and achieve a score of 70 or higher, you will have 5 or 10 points added to your numerical ratings depending on the nature of their preference. Entitlement to veterans’ preference does not guarantee a job. There are many ways an agency can fill a vacancy other than by appointment from a list of eligibles. As a veteran, letter carrier and citizen, you have dedicated your life to service. You have worked hard to protect this country, and you have continued your service as a letter carrier and community member. The Postal Service is the largest employer of veterans outside of the Department of Defense and nearly a quarter of NALC members are letter carriers. On Capitol Hill, lawmakers are constantly debating issues and considering proposals that have the potential to impact veterans and letter carriers. Whether it's retirement, social security and health care benefits, hiring preference, right to work, veterans programs or proposals that impact the Department of Veterans Affairs, you have a voice and representation in Washington. NALC’s Legislative and Political Affairs department monitors legislation that affects letter carriers and veterans. There are many legislative resources available for you to stay connected. If you have questions, please contact the Legislative and Political Affairs department. The NALC Veterans Group is made up of NALC members who are also military veterans. As veterans, we share valuable experiences such as discipline, focus and sacrifice. As letter carriers and NALC members, active and retired, we have a common employer (USPS), the same labor union (NALC) and we provide continued service to America. Our common bond of experiences and skills allows us to provide resources, benefits and support to each other—as no one person or no other group could. Our continued service to the public, especially now as letter carriers embedded in our local communities, provides a familiar and genuine pride. Many of us have joined veterans organizations, finding comfort and camaraderie with others who have served. Others work as volunteers in their communities—for both veteran and non-veteran causes and events. Teamwork. Compassion. Purpose. This section will provide a general directory for veteran groups and organizations (or those that support either) and post upcoming volunteer opportunities that specifically assist/honor veterans. To speak with someone about the NALC Veterans Group, please contact the community services coordinator at (202) 393-4695. Thank you for your service, sacrifice and willingness to support each other. Stand Down—The original Stand Down for homeless veterans was modeled after the Stand Down concept used during the Vietnam War to provide a safe retreat for units returning from combat operations. At secure base camp areas, troops were able to take care of personal hygiene, get clean uniforms, enjoy warm meals, receive medical and dental care, mail and receive letters, and enjoy the camaraderie of friends in a safe environment. Stand Down afforded battle-weary soldiers the opportunity to renew their spirit, health and overall sense of well-being. That is the purpose of the Stand Down for homeless veterans, and achieving those objectives requires a wide range of support services and time. The program is successful because it brings these services to one location, making them more accessible to homeless veterans. Click here to to see a list of Stand Down events. USERRA protects the job rights of individuals who voluntarily or involuntarily leave employment positions to undertake military service or certain types of service in the National Disaster Medical System. USERRA also prohibits employers from discriminating against past and present members of the uniformed services, and applicants to the uniformed services. Union Veterans Council—An AFL-CIO constituency group for union member veterans or union member veteran supporters. Links to resources for knowing your rights, for health care, for financial advice and more.